Home/Injuries/Lower Body Injuries/Runner’s Knee (Patellofemoral Pain Syndrome)/How to Fix Runner’s Knee? This article and video will teach you how to fix Runner’s Knee. Knee pain is a common reason for visits to a doctor for both runner’s and non-runners. 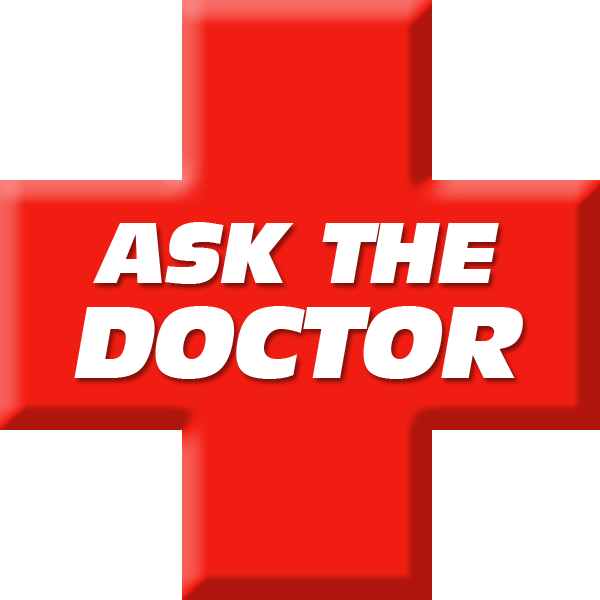 The problem with most doctor’s is they are more concerned with what to call your knee pain and not necessarily how to fix it. There are so many options out there to fix Runner’s Knee. The main problem is choosing from all of these options. In reality it is important to know why you are getting Runner’s Knee so that you can choose the BEST available option. Runner’s Knee goes by many names. Chondromalacia, Chondromalacia Patella, Patellofemoral Pain Syndrome (PFPS), Patellofemoral Stress Syndrome (PFSS), Patella tracking Error, Malicious Malalignment Syndrome, Weak Quads, Weak VMO and probably more that I am not mentioning! All of these names cause a lot of confusion with doctors and patients but they are just different ways of naming the same issue. Call it what you want but know that what is important is that you learn how to fix Runner’s Knee. The first thing to do is remove the variable that is either causing your Runner’s Knee or contributing to it. For example; if running is irritating it and you keep running it will worsen and may lead to permanent damage to your knee. Proper diagnosis is critical as Runner’s Knee (Chondromalacia Patella) is commonly misdiagnosed as Ilitotibial Band Syndrome, Arthritis and strains or sprains leading to poor and ineffective treatment suggestions. Rest from activity, especially those activities that require running, jumping, hiking and repetitive knee bending (like lunges or squats) may be necessary as they aggravate Runner’s Knee. No amount of ice or Ibuprofen will help if you do not rest and stop aggravating your Runner’s Knee. Sometimes rest is not enough and to fix Runner’s Knee treatment may be necessary. Do I need Crutches to Fix Runner’s Knee? No. Not unless your were misdiagnosed. It is not necessary to be non-weight bearing for an extended period. Casting or other devices that immobilize the knee for an extended period may be counter-productive. There are various therapeutic interventions that can significantly reduce the pain associated with Runner’s Knee. These include, compression bracing, stretching, strengthening, orthotics, self massage (foam roller), myofascial release, ultrasound, proper shoes and orthotics. Sometimes change is good. By changing shoes you might change how your foot interacts with the ground. This in turn will affect the amount of rotation and torque at your knee which may be causing your Runner’s Knee. There is no such thing as the “right shoe” or a shoe that is specifically designed to fix Runner’s Knee. Common sense would dictate that if you were going to try new shoes to purchase a new shoe that is dramatically different to what you are currently wearing. Consider a rocker bottom shoe like a Hoka or a zero drop shoe like an Altra for example. If you live in San Diego go to Milestone Running Shop for your shoes. You will not be disappointed. Over the counter orthotics are a cheap and sometimes effective method of treating Runner’s Knee. If the over the counter orthotic is going to have a chance at being effective it must have a supportive, flexible arch support and be comfortable. If the orthotic is too stiff, hard, uncomfortable and irritates your foot you will not be able to wear it and it will not help fix Runner’s Knee. 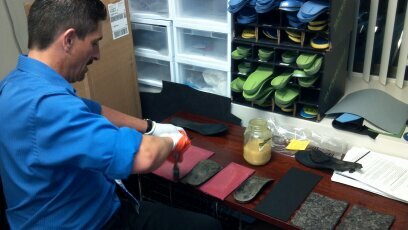 Custom orthotics can be an effective treatment to fix Runner’s Knee. To be effective, they must fit into your shoes, be comfortable and have a flexible, supportive arch as part of the custom orthotic design. Proper height, density and flexibility of the custom orthotic is critical to it being effective. If you have custom orthotics that are uncomfortable, do not fit into your shoes or aggravate your feet or your Runners Knee you will be unable to heal. If you have an uncomfortable or ineffective pair of custom orthotics they may be able to be modified for a fraction of the cost compared to buying new custom orthotics. Taping can be effective in treating Runner’s Knee. 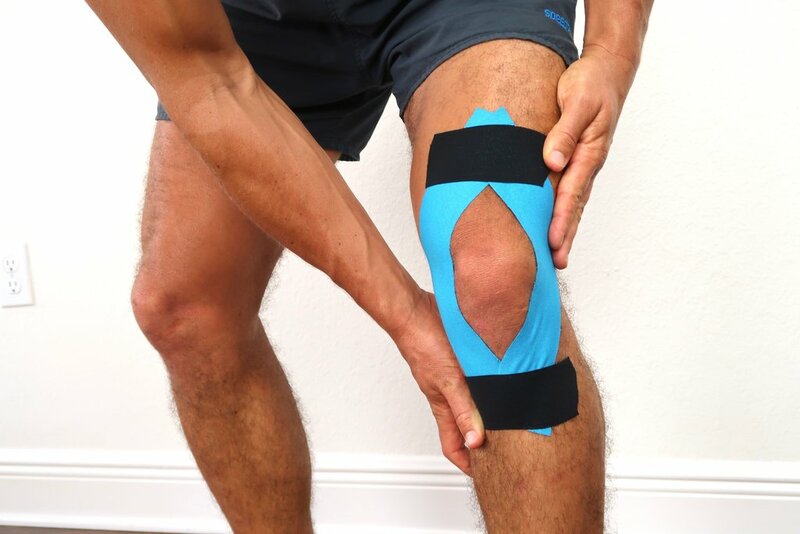 A common and effective taping procedure tapes along the Quadriceps to provide support. Taping can be inconvenient. There is a more effective methods of treating Runner’s Knee. A knee Compression brace with enough compression may remove some of the stress and pain associated with Runner’s Knee. The proper compression sleeve may help alleviate some of the stress and pain associated with Runner’s Knee although it will not fix it. This can be important if you have an upcoming race or event that you want to get through. 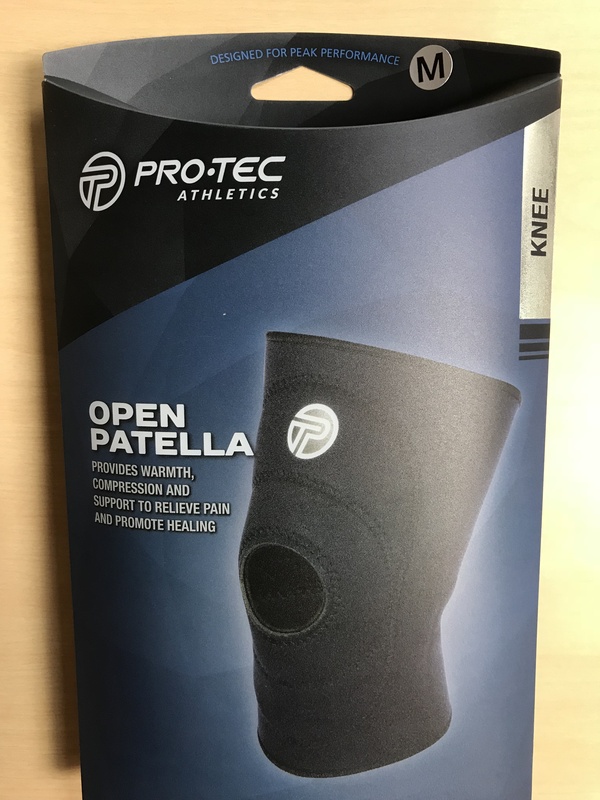 We have found the compression sleeve with a patella cut-out to be effective in mild cases and can also be used in conjunction with Runner’s Knee Taping. Stretching is typically not an effective therapy to fix Runner’s Knee. However, if used as a part of an overall plan to fix it than it should not be discouraged. Stretching like any other intervention must be done correctly to be effective. In our experience it is not unusual for patients to be over-stretching and actually hurting themselves! These are all techniques that apply manual massage directly to the muscles around the knee. While this therapy can be effective it is important to apply the correct amount of pressure to ensure you do not further damage any muscles or tendons. Too much pressure, too little pressure or the wrong kind of pressure (like using a golf ball) can lead to ineffective treatment and worsening of Runner’s Knee. Ultrasound can be an effective treatment for Runner’s Knee when combined with some or all the above interventions. 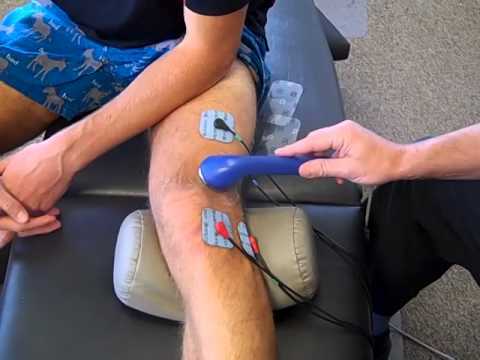 Ultrasound can be used to break up scar tissue and increase blood flow in and around the kneecap and Quadriceps tendon. The Quadriceps tendon is notorious for having a lack of blood flow. Blood is required for Runner’s Knee to heal. The AlterG is one of the most modern and effective treatments for Runner’s Knee and allows the patient to run or walk while their Runner’s Knee is healing. 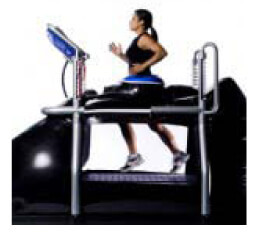 The AlterG does this by “unweighting” a person until there is not enough pressure on the Knee to cause pain. Once this is achieved the patient can run or walk without aggravating the Runner’s Knee. This allows them to keep up their cardio, continue to train for an event and stimulates blood flow into the Quadriceps and knee to speed healing. Cortisone is not recommended to fix Runners Knee. Cortisone is a catabolic hormone meaning it breaks things down (as opposed to an anabolic hormone that builds tissue). While it does break down inflammation it also breaks down tissue, in this case where your quadriceps inserts on the bone. This can cause long term damage to the tendon and is therefore not recommended. 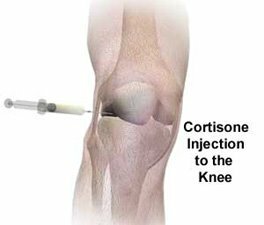 However, if you have pre-patella bursitis then a one time cortisone shot could prove quite helpful. 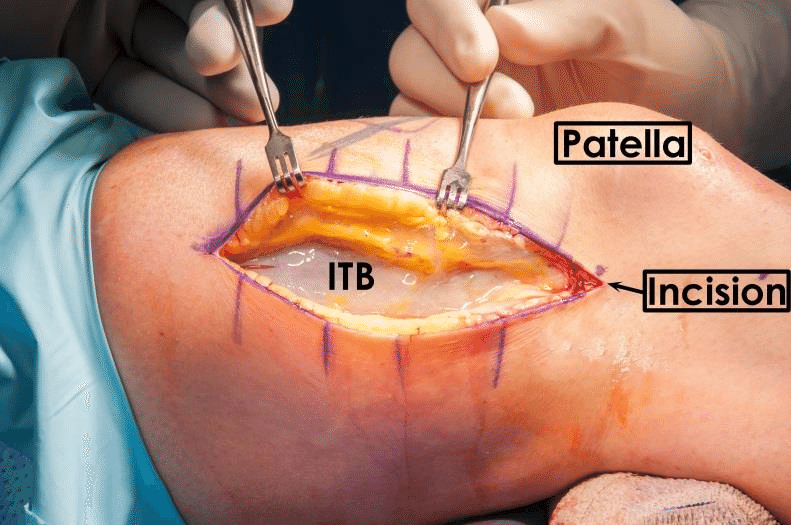 Surgery is not usually necessary to fix Runners Knee. However, if you go to a surgeon and they recommend surgery……. what did you expect. Runners Knee (Patellofemoral Pain Syndrome), if treated conservatively will almost always heal and not require surgery. If you need more information about Runners Knee (Patellofemoral Pain Syndrome) and the treatments that can fix it please email info@sdri.net or call San Diego Running Institute at 858-268-8525 to schedule an appointment.